Pastor Tastonga Moore was born in Portland, she was saved and ordained in her early twenties in the ministry of the Full Gospel Pentecostal Association under the leadership of Bishop A. A. Wells. She moved to Denver, Colorado and co-founded the Grace and Truth Full Gospel Pentecostal Church. She later volunteered and provided ministry for girls at the Gilliam Youth Services Center, a detention center for youth. Due to her time spent at the center, Pastor Moore was moved to begin a prevention program for the girls before they got into trouble, and in 1994 founded the Positive Connection program. Since then, the program has expanded to serve more girls from the community, the Denver Juvenile Court as well as other community justice partners. Positive Connection now provides Prevention, Intervention and Redirection Services to young ladies ages 9 to 18. Mrs. Moore is now the Pastor of Grace and Truth Church, the wife of Overseer Theodis Moore and the mother of two children. Bishop Theodis Moore was born and raised in Louisiana, he begin his at the early age of thirteen years old. He received his ordination under Bishop A.A. Wells of the Full Gospel Pentecostal Association, then later in his home state, he founded and pastored his first church. He was later pastored in Mississippi for ten years. In 1994 Theodis discovered he had cancer, however, as a former boxer, he was prepared and trained to fight! While continuing to fight his battle he continued to minister the Word of God. Years later, he moved to Denver, Colorado where he married Pastor Tastonga Moore and is the father of six children. 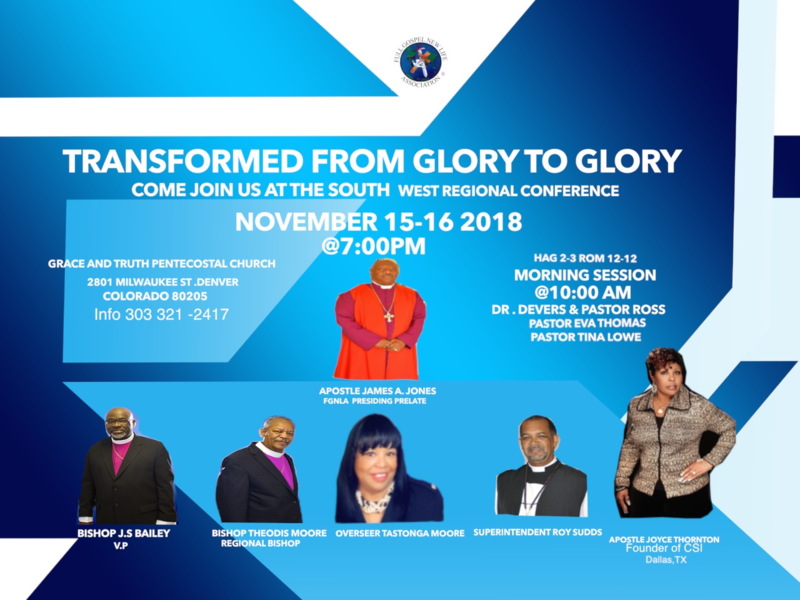 He serves as Bishop of the southwest region for Full Gospel New Life Association and is the Co-Pastor for Grace and Truth Full Gospel Pentecostal Church. We believe a life with God can transform even the most closed of hearts and heal even the most suffered of people. Grace and Truth F.G.P. Church strives to engage with it's community and reach out to all people who seek Jesus Christ. From our to community to yours, please come connect with us! Having a prosperous life comes in many different forms, including mentally, spirtually, physically, and financially. Be inspired to live a life of abundant generosity and consider donating to Grace and Truth Full Gospel Pentecostal Church. Your financial givings help support our entire ministry, church improvements, and church related events. Please fill in the information below to give online. Send checks and/or money orders to our mailing address for donation. Consider in person donations as well. "Grace and Truth by Jesus Christ"
© 2018 Grace And Truth Full Gospel Pentecostal Church All Rights Reserved.